Detached holiday home in a quiet but central location. Enjoy the large, enclosed garden that belongs to the house. Only you use this 1. 000sqm. Enjoy relaxing days in a beautiful landscape - or enjoy the good connection for shopping tours in the middle of NRW. Escheln is off the main road and has no through traffic. Just steps away you can start your trip into nature. The house has 90m² of living space and can accommodate 2 to max. 4 guests. 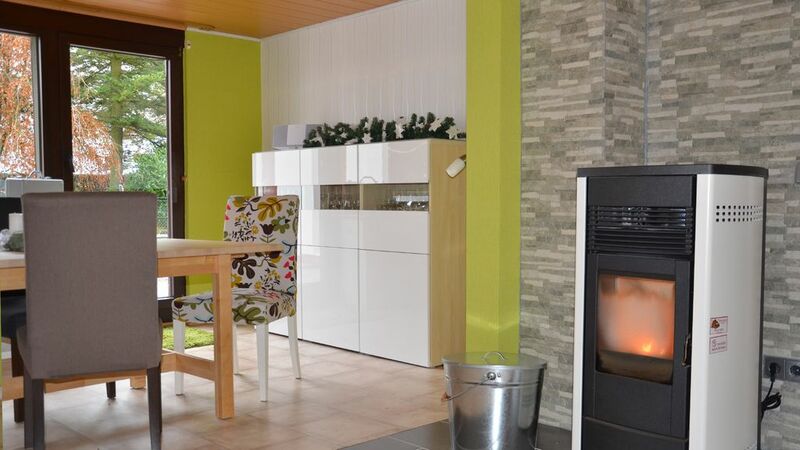 Is split detached holiday home in kitchen / bathroom / living room / bedroom and a further living space. A double bed with two single mattresses (0,9x2,0m), a bed with 1.40 width and a bed that can be extended to 1.60 width offer optimum sleeping comfort. The bathroom and the kitchen are modern. When setting up, we placed great emphasis on lightness and practicality. The house is heated with a pellet stove. Enjoy cozy evenings in the winter months with a view of the flames. The pellet stove is fully automatic. On arrival the oven, already filled in the winter months and in the transitional period. More 15kg pellets are available. Additional pellets are available. Heating with the pellets is a clean thing. Whether times fast snack or a big menu, the kitchen is fully equipped. Dishes, glasses, pots and cutlery are plentiful. Detergent and dry towels are provided. Toaster, coffee maker and blender + Sanseo included. And after the menu is then responsible for the washing machine. A washing machine for small laundry is also available in between. The living room is furnished with a large dining table and cozy wingback chairs and a comfortable couch. Here you can enjoy a hearty breakfast with view of the garden. Experience entertainment in friendly company. Or use the time to browse through the comfortable armchairs. A selection of current novels is ready for you. You can cuddle and sleep well in the two bedrooms. The large double bed in the first bedroom, has two single mattresses 90x200cm. The blankets are allergen environment from synthetic fibers. On arrival, the beds are made ready. XXL ceiling of 1,50x2,00m are cozy and warm. The bathroom has a walk-in shower. Towels and hair dryer are ready for you. There are games and puzzles in the house. From the dining area it goes into the large garden. Barbecue and garden furniture are available. Two bicycles can be used free of charge. The garden is fenced and dogs are allowed to romp freely. Only you use this garden during the stay. You park your car right outside the front door. The bathroom has been completely renovated in 2014. Enjoy a shower under the multifunction showerhead. Our huge shower is at ground level tiled and therefore accessible. The large multi-function showerhead promises a very special shower experience - back massage or tropical shower, the choice is yours. A towel set, hair dryer and toiletries are available for you. The house is partly wooden floors and a ceiling height of 2.24 meters. This house is absolutely charming. All rooms are well-proportioned and light and airy. Everything is equipped to the highest of standards and spotlessly clean. The kitchen was well kitted out with dishwasher, washing machine, kettle, toaster, coffee machine & loads of crockery & cutlery. Outside is a large garden and I loved the fact that there were chairs and tables on every side so you could always sit in the sun. We used the large bedroom which had ample storage and a really comfortable bed.There is also a large second bedroom which was very pleasant and had two folders full of information about the area which were very well organised . The bathroom was very spacious with a great shower and again, immaculately clean. We made use of the bikes and although we were only at Haus Otto for a few days we realised what a lovely, friendly area it is. We walked to St. Hubert to eat in the restaurants in the evenings & especially enjoyed Fellini's & Il Carretto, both Italian. Il Carretto in particular was very friendly and helped us out (via the internet!) with the menu when our knowledge of German failed us. There is a good Edeka supermarket in the same town and other larger ones a little further afield, but not far if using the car. The town had a couple of cafes and there are lots of other lovely places to visit for coffee and cake. Kempen is a good place to visit with a pedestrianised centre and plenty of shops and cafes. Silke was an excellent host - friendly , helpful and she speaks very good English. I can recommend this accommodation to anyone - kids would be very happy there and safe to run and play in the garden as it is completely enclosed. Our stay was too short and we will definitely return in the future. Many thanks Silke for a wonderful stay. Auch das Infomaterial über die nähere und weitere Umgebung ist äußerst umfangreich. Die Vermieter wohnen nebenan, sind sehr freundlich und sympathisch und gern bereit, weitere Tipps und Informationen zu geben. Wir können dieses Haus wärmstens empfehlen! Den Kindern und uns hat es an nichts gefehlt und wir kommen gerne wieder! Dieses schöne Haus steht am Rande des Ruhrgebietes, Nähe der holländischen Grenze, mitten im Grünen. Von dort sind alle Großstädte am Niederrhein schnell zu erreichen und man hat trotzalledem Natur gleich vor der Haustür. Das Haus ist Top ausgestattet und liebevoll eingerichtet, es fehlt an nichts . Im großen eingezäunten Garten konnte unsere Hündin frei laufen. Sehr schöne Unterkunft, ideal für Urlaub mit Hund. Die Unterkunft ist sehr liebevoll eingerichtet und alles top. Sehr nette Vermieter. Für den Hund war auch bestens vorgesorgt, sowas hab ich vorher noch nie gehabt. Hier kann man einen wunderschönen Urlaub verbringen, egal zu welcher Jahreszeit. Ruhr area, Krefeld, Hollandsche itself to Cologne is just 60 km away. Central but quiet in the midst of a nature reserve. Here you can combine relaxation with activity holidays. Kempen has a beautiful old town which invites you to stroll, shop and dine. All the necessary facilities are available.